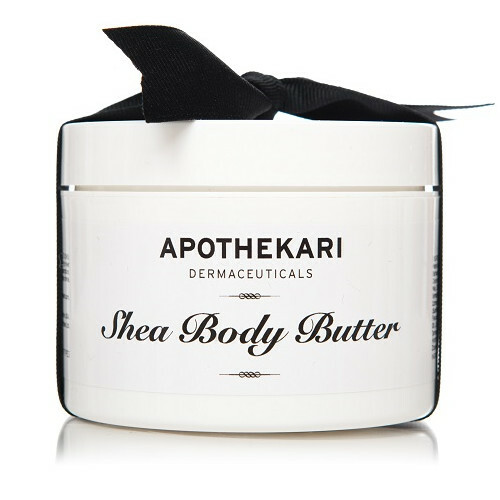 Apothekari Shea Body Butter (210 g/7 oz) is made with organic shea butter and infused with healing herbs, fresh oils, natural vegetarian waxes and an intoxicating blend of essential oils to heal dry, cracked and callused skin. This extra-rich, protective crème is made with the highest quality organic shea butter from Africa. It penetrates deeply to heal dry, cracked, and callused skin and is also excellent as a daily hand crème, aiding in the health of cuticles and nails. Also known as karite, shea is indigenous to the savannah lands that extend from Senegal to eastern Uganda. Shea butter is a remarkable, all-purpose moisturizer and skin protector. It leaves the skin feeling soft and well-moisturized yet not greasy. By supporting African shea producers we help to increase the value of the living shea tree, engendering conservation of indigenous African woodland for future generations. Combined with healing herbs, food-grade fresh vegetable oils, natural vegetable waxes, and soothing aromatic lavender water, Apothekari Shea Body Butter helps parched skin regain a fresh, supple texture. A blend of essential oils delivers a delightful, refreshing scent. If you like this product you may also wish to consider Apothekari Bamboo Lemongrass Foaming Body Polish or Apothekari Shea Butter & Bamboo Polish Set. Massage into clean skin as often as needed. For extra hydration, apply liberally to feet and hands, then wrap in mitts and booties to ensure maximum absorption. Also works as a massage crème.